The three dimensionality, the scope to use many types of materials, the opportunity to represent a concept on a scale that can go beyond the size of a room, hall or even a building, the choice to present the art in a setting beyond the constraints of the four walls, the chance to experience it any time of the day or night or in unexpected places, their ability to use the elements as a part of the art. All this and more attract me to sculptures like no other art form can. To me a sculpture is energy in motion frozen in time, captured by the artist as a snapshot. I also love sculpture parks. Sculpture parks are an ideal setting for viewing and enjoying a sculpture. There is something about a walking amidst the nature, away from the crowds so typical of art galleries or museums and enjoying the art on your own that seems to do justice to the effort of the artist. To me art is best enjoyed in solitude and this is possible in a sculpture park. Here you can listen to the artist and not just see his work. Through art you can discover yourself in a sculpture park. There are sculpture parks and there is Storm King. None of the sculpture parks that I have been to in my life has prepared me for the experience I had when I visited the Storm King sculpture park. Located in lower Hudson Valley, it is spread over 500 acres of hills, fields and woods and is home to more than 100 sculptures. Everything here is monumental, the size of the sculptures, landscape and the mountains over looking the park. All the sculptures are strategically located and enable a viewing experience that is truly breath taking. It is almost like being used to watching black & white 8mm movies all your life and suddenly being exposed to “Avatar” in an IMAX theatre! If you are an art aficionado it is a must see place before you die. It was in 1982 that I was first exposed to Maya Lin. I was a 19year old undergraduate student. Having read and reread Fountain Head, Howard Roark was my hero. I briefly dabbled with the idea of becoming an architect before choosing commerce. I chanced upon an article about Maya Lin and Vietnam Memorial. The fact that she won such the prestigious competition as an undergraduate student was very inspirational. The simplicity of her idea of inscribing the names of all the martyrs of the Vietnam War on a black granite wall stayed with me for a long time. I realized the impact she had on me, 14 years later, when N.T.Rama Rao former movie star and the Chief Minister of Andhra Pradesh died. Immediately after the funeral there was a talk on a memorial in his honor. I recalled Maya’s work for the Vietnam Memorial and drew the following design. 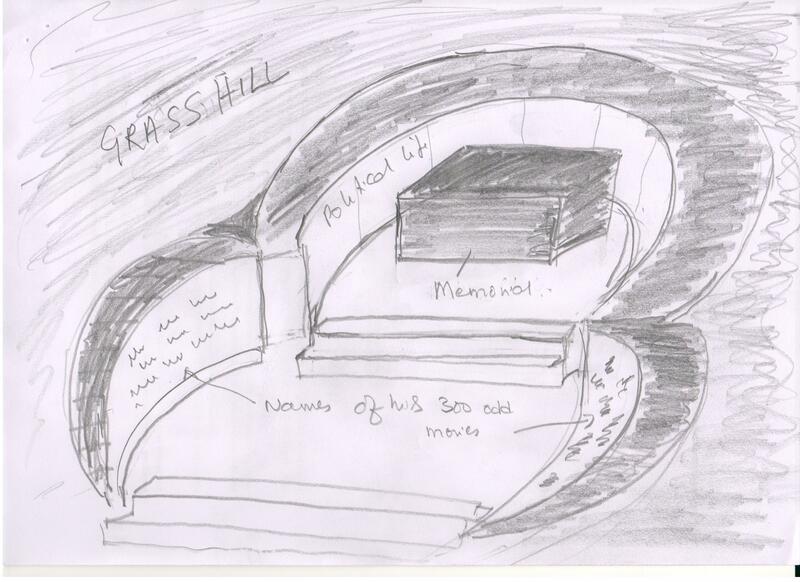 I had designed it to cut into a mound with two levels, signifying the two stages in his life. The first one capturing the name of all his movies and the other detailing his life as a politician. My idea was that as people looked at the names of each of his movies they would relive the movie and the role he played in their mind. The sketch I drew resembled something like this. In any event, neither was I qualified to submit my proposal nor did the Government actually seek any proposals from the public. Thus ended my career as a memorial designer even before it began! 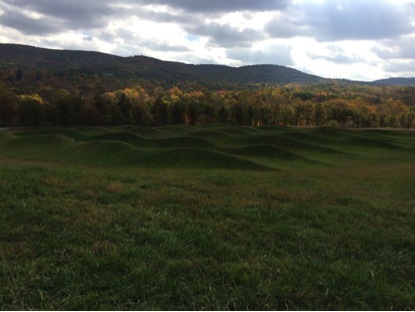 However Maya Lin’s work continued to stay with me over the years. Coming back to my visit to Storm King, I was being shown around the various sculptures in the park by Nora Lawrence, Associate Curator in a buggy. As we were nearing the top of a hill, she slowed down and announced that we were going to see Maya Lin’s Wave Field! I let out an excited shout in the sheer anticipation of watching her celebrated work, jumped out of the buggy even before it stopped and ran hurriedly to sloping edge of the hill. I stood transfixed and watched the undulations of earth and grass against the large mountains in the immediate background. Amongst the 100 odd sculptures in the park, this was perhaps the only installation made only from earth. Ishvara (Lord) is everywhere, in and through everything. So everything can be regarded as a form of Ishvara, in the way that a wave is a form of the water constituting the ocean. Ishvara is the sum total of all things, in the way that the ocean is the sum total of all waves, representing the macrocosm, whereas the individual wave or jiva (individual) is the microcosm. Instead of the water, ocean and waves, I saw the underlying earth, mountains and the waves in the Wave Field. The mountains here represented the macrocosm and individual waves in the Wave Field represented the microcosm. ‘Oh lord, though I am aware of the non-difference between you and me, I still wish to say that I belong to you. As we drove the buggy down the hill, Nora asked me whether I wanted to walk through the Wave Field and experience the artist’s original intention of walking amidst the waves. I declined as I somehow felt my reaction to this work transcended into being a sacred experience and did not want to disturb that feeling by walking over it. We moved on to the next sculpture. Then the irony of the artists name being ‘Maya’ ( Illusion in Sanskrit) struck me. Storm King turned from being a sculpture park into a spiritual park. This is a great blog Kiran! Gives me a new perspective on sculptures. I understand about the sculpture but, more than that I really like the way you narrate about any subject and which gets into the ‘lives sculptures’ as above somebody got new perspective about sculpture ! excellent….Wave Field is really revolutionary sculpture and was the leading example for many sculptors to start using larger tracts of land for installations. A sculptor here in Bangalore -Umesh- too tried his hand in doing such an installation sometime in 2008 or so. Thank you Chitra. Look forward to the same. We must do something in Shankarpally too !